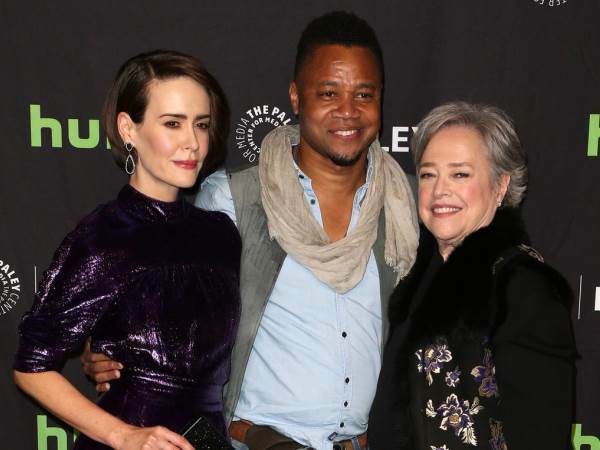 Cuba Gooding Jr. has been slammed on Twitter for lifting up Sarah Paulson’s dress during PaleyFest on Sunday evening. The two stars attended the event in Los Angeles to talk about Ryan Murphy’s TV show, American Horror Story: Roanoke, ahead of a preview screening. Cast members were introduced to the stage for a panel discussion on the show, but when Sarah stood up to welcome her co-star Kathy Bates, Cuba made the unusual move of pulling up the skirt of her glistening purple dress, exposing her thighs and underwear to the audience. Although Sarah, 42, spun around shrieking she appeared to take it in her stride, but fans weren’t so impressed and took to social media to share their outrage at the actor’s behaviour. Read more: Cuba Gooding Jr. not bothered by bar brawl “Okay, yes I went back to screenshot this. But does he seriously think this is okay? @cubagoodingjr @MsSarahPaulson,” one user captioned stills from the incident, while another fumed, “How would @cubagoodingjr react if a man walked up to his daughter, Piper and lifted her dress up behind her back? #itsneverok”. Another posted: “@cubagoodingjr hi, dude. did you apologise to Sarah? you should if you didn't bc (because) what you did was Gross and Disrespectful”. Cuba has three children, daughter Piper – who was born in 2005 - and sons Mason and Spencer with ex-wife Sara Kapfer. He and Sarah, play lovers and onscreen co-stars in the documentary My Roanoke Nightmare, which forms the backdrop to the show. They also both starred in Ryan’s The People v. O. J. Simpson: American Crime Story. Neither have commented on the incident. It wasn’t all drama though the stars teased fans about the upcoming crossover series of AHS, merging the first season Murder House with the third instalment, Coven. Kathy, 68, also appeared to hint that Sarah will play the late Princess Diana in the next series of Ryan’s show Feud, which will focus on the royal and her ex-husband Prince Charles. The Misery star kept referring to her friend as “the people’s princess”, a nickname given to Diana before her untimely death in 1997.